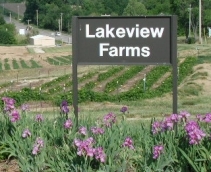 Lakeview farms is a family oriented pick your own ( PYO / U-Pick) berry (strawberry, raspberry), and gourd farm located in St. Charles County Missouri near O'Fallon and St. Peters. A good selection of dried gourds is currently available for sale. Click here for more information. For more information on strawberries, raspberries, or dried gourds, click on the colored crops bar at the top of this screen. If you are planning to bring children, we have lots of fun things (including berry picking) for kids to do. Lakeview Farms is a family owned farm that serves only the St. Louis metro area. None of our berries or gourds are shipped out of the St. Louis area. We hire only local teenagers, college students, and occasionally local adults that have an interest in working outside. We do not employ migrant farm workers(who in my opinion are very dependable and hard working people); this means that 100% of our berry production is sold U-Pick -- we are not able to sell "prepicked" berries. Lakeview Farms is operated under Sustainable Farming practices that try to minimize the negative impact of our operations on the environment.